Garmisch-Partenkirchen is a mountain resort town in Bavaria, southern Germany. 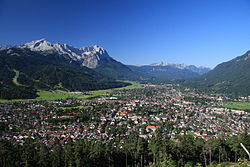 It is the administrative centre of the district of Garmisch-Partenkirchen, in the Oberbayern region, and the district is on the border with Austria. Nearby is Germany's highest mountain, Zugspitze, at 2,962 m (9,718 ft.). The town was the site of the 1936 Winter Olympic Games. This article uses material from the Wikipedia article "Garmisch-Partenkirchen", which is released under the Creative Commons Attribution-Share-Alike 3.0 License.